As one of this year's 30th Anniversary aims, ideas and suggestions that are your quilting 'Pearls Of Wisdom' are to be collated into a commemorative booklet that can be shared with all members. Please email the office or send in any contribution as all will be greatly appreciated! Isobel Lancashire presents Friday showcase at the Guild office at 10am on Friday, 3 August 2012. The entry fee is $5 entry for members and $10 for non members. Pictured is Catherine Babidge, our July Friday Showcase Exhibitor and current Vice President, standing in front of a collaborative quilt that she and others worked on, inspired by Gee's Bend Quilters. Over forty members attended Cath's amusing presentation of her quilting journey, and all could relate to her tales of the ubiquitous "UFO". Following Isobel's Showcase on August 3rd, Cath's quilts will be taken down from the display walls in the Guild Office and a selection of Isobel's quilts will be hung. Selected quilts from each Friday Showcase exhibitor remain on the walls of the office for the following month, or two, for visitors and volunteers to enjoy. Please come along in August to hear Isobel relate her quilting quest.........All welcome! The prolific Camden Country Quilters are again holding their exhibition in August. They are exhibiting a large display of quilts including this year's Challenge. There will be a demonstration table, trading tables, a quilt shop, and refreshments area. This is the very effective Spool block and, constructed as a 6 inch block with high contrast black-on-white print fabric plus red print fabric, will deliver a very dramatic quilt top for the lucky winner. There is still time before Tuesday August 14 to send your self named blocks to the Guild Office if you cant attend the Burwood Guild meeting on August 18, where the winner of the draw will win all blocks submitted. The Quilters' Guild of New South Wales Inc. houses an extensive "goldmine" of information for both the quilting beginner and experienced quilter. Members can avail themselves of books, current magazines and pamphlets, CD's, DVD's and slide sets, covering a wide range of stitching interest, from "how-to" to history. Fabric Dyeing and Embellishment, Block construction, Applique, Art quilts, Design inspiration, Contemporary, Traditional, Textile history......Whatever is your current passion or whether you have "quilters block" then your library is sure to give you hours of delight. There are a number of new entries on the shelves just waiting to spark creative juices. Of special note are the many superb books recently donated from the library of the late Narelle Grieve. Always a vibrant and "giving" Guild member, forever intent on sharing a quilt inspiration, this latest generosity from her family is warmly appreciated, and is now available for all guild members to enjoy. 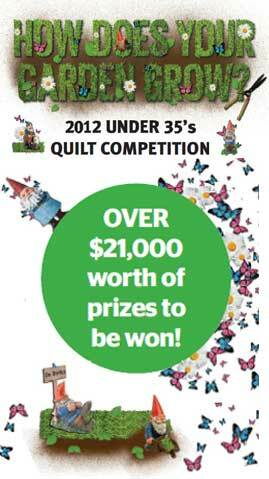 Exquisite Quilts and Flowers 2012 Exhibition is scheduled for next weekend in Bulli. Come and view the lovely display accompanied by live music from performer Mark Matthews. It is with regret that the Committee advises that the Bound to Please workshop with Brenda Gael Smith, scheduled for 1 August 2012, has been cancelled. Many quilt enthusiasts visited this years Quilt Show accompanied by their camera! The Quilters' Guild of NSW Inc. approves the desire to take photos of the exhibition for one's own records only. Quilt photography is permitted for personal use only. Images must NOT be published online or in other media unless you have the consent of the relevant quilt maker. If you wish to photograph and publish for commercial purposes, please apply to the Membership Desk for special permission. Many online media users (Facebook and Bloggers) are accompanying Quilt Show reports with photos of quilts plus a snap of the accompanying swing tag showing Maker's name and Quilt Inspiration / construction details alongside. 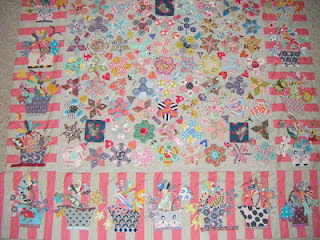 The addition of these details in another photo does not negate the policy that quilt images must not be used. All quiltmakers must have given personal approval for any image of their quilt being journalised in any public on-line forum. Come and join other dedicated Guild members as tops are Pieced, Appliqued and basted for quilting, thus producing wonderful quilts for the many needy children in society. Linda Butcher is the member to whom further enquiries can be made. Please bring your own lunch and sewing kit and join the other volunteers for this worthy cause. A reminder that the next Quilt Study Group Meeting will be held on 21 July at 2pm. The Speaker will be Margaret Sampson George and the quilt design focus is Medallion Quilts. HOWEVER Please Note : There is a change to venue details. Next month the Australian Textile Arts and Surface Design Association Inc. will once again be holding their biennial exhibition. This display of member's artworks, titled Fragment, demonstrates ATASDA's stunning diversity within the textile art world. Fabrication techniques cover a diverse spectrum of traditional and innovative contemporary exploration, from dyeing, felting, embroidery, knitting, weaving, printing, and other embellishment and cloth construction methods, with the resulting works, both two and three dimensional, an exciting visual odyssey for anyone involved with, and appreciative of, Textile Art. Members from across Australia are delighted, this year, to share their journeys within the textile art world to visitors at Palm House, Royal Botanic Gardens, Sydney. Note : Entry to Palm House is Free. One of the highlights from the 2012 Sydney Quilt Show opening day awards ceremony was the presentation of the replican Frederica Josephson coverlet to representatives of the National Trust of Australia (NSW). You can read more about this project on the new Replica Frederica Josephson Coverlet Project Page. Kim Bradley Creations – who made and donated the acrylic templates and all the papers we used. By the way, in some recent blog housekeeping, a number of past reports from activities of the Guild's Quilt Study Group have been transferred to this blog. Please excuse any disruption to your RSS feeds or e-mail subscriptions as part of this process. Taking Leaf of My Senses, a solo exhibition of Guild member Sue Dennis opens at Warwick Art Gallery, Queensland on 6 July and continues to 19 August 2012. Whether Sue is in the Australian bush, travelling overseas or at home trying to tame her garden, she is observing the shape, colour and variety of foliage present. 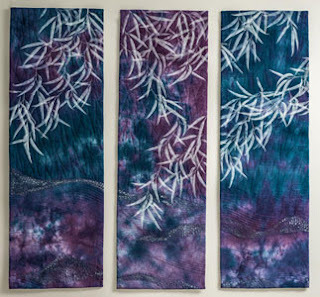 A humble leaf is transformed via paint, fabric and stitch into a unique snapshot of place and time. Work from 2006 to 2012, and both Australia and North America will be represented in her exhibition. Join members of the Quilt Study Group of New South Wales to learn more about Medallion Quilts. Our guest speaker this month is Margaret Sampson George who is well known for her wonderful quilts using this method of construction. She will show many examples of her quilts, whilst explaining how they have changed over the years. Please bring your own Medallion Quilts for Show and tell after Margaret's Talk. Entry to The Powerhouse is free . . Meeting costs are payable at the meeting. Afternoon tea will be provided and anyone is most welcome to attend these meetings. Many quilters wear several creative hats; interest in all things "Textiles" broadens our knowledge and appreciation of our craft of choice.